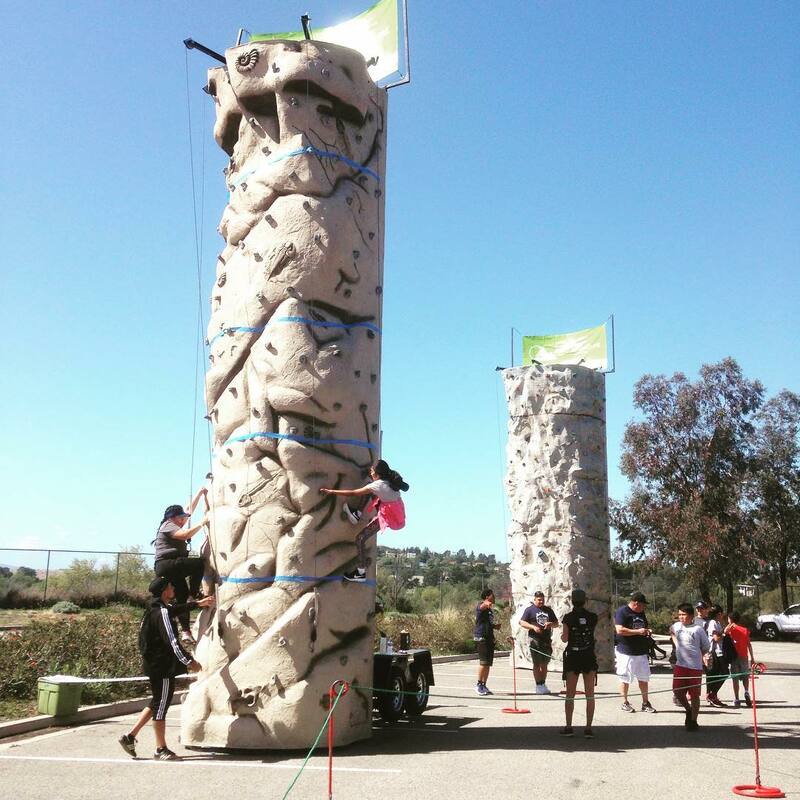 Two 24-foot vertical mobile climbing walls available to rent for your next event. Fully-trained and certified staff will instruct, train, and guide climbers of all ages and athletic abilities. We transport the rock wall directly to your location. Full set up and break down service included. One rock wall services 35-40 climbers per hour. Advertising opportunity: you supply the banner, we hang it for all to see. As with many of arc‘s amazing opportunities, the rock wall is the perfect activity for all ages — our fully-trained and certified staff has worked with kids as young as 4, up to older teens and adults. We have been in business since 2001, serving clients at schools, parks and corporations all across Southern California. We can also provide team building and adventure race activities to go with the rock wall, customized to your group's age range and size. Travel surcharge may be added for long distance events. We'll contact you in 24 hrs. Great company to rent a rock wall from. I would definitely rent from them again. They were on time, quick with set up and their staff was very nice and great with all the kids who came by. The staff were quick and efficient with their set-up. Remarkably, with the encouragement of staff all the kids were eager to get up on the wall. Everyone from arc was incredibly friendly, and we'll definitely be using their services for upcoming events. I am the Assistant Principal of a Middle School in Huntington Park, and I was so impressed with the arc experience! Not only were they willing to work within our budget, but they were so friendly and accommodating. On the day of our event, they arrived over an hour and a half early to set up, and the staff was so helpful and great with our kids. We had two rock walls and four other team-building stations, and they were all a huge success. It was the perfect way to welcome our new 6th graders to our school, and we can't wait to use arc again! Wow these people knocked it out of the park! I was afraid they would be more expensive than my usual vendor. They weren't. I was afraid they'd show up late (or not at all). Nope - 2 hours early! I was afraid they would be unprofessional during the event. Not even close! They drove up to Santa Barbara on a Sunday morning, set up the wall, worked my event in blazing sun, never complained once about anything, and left at the peak of southbound traffic for what I'm sure was a very long slow drive home. They charged a modest delivery charge, provided all forms and oversight, and everyone had fun all day. Nice job arc! We sourced arc to bring their rock wall to our church event and it was a hit! The staff was professional and punctual. Great service and experience. I would definitely rent from them again. Thanks arc adventure! arc Rock Walls will make your next event a hit with all your guests! We have two rock walls for rent, each one measuring 25 feet of pure vertical adrenaline! They can be used at your next party, upcoming reunion, company event, school festival, or anywhere you need us to be! Take advantage of this all-inclusive deal. Our highly trained staff runs on- and off-site activities that are unforgettable and maybe even a little enriching. We handle all the logistics and clean up, and you will have guests with lasting memories of fun and adventure.